Ahead of Congress general secretary for Uttar Pradesh (east) Priyanka Gandhi's roadshow in Lucknow, the party cadre's overzealous efforts are catching eyeballs. Congress cadre readies to welcome Priyanka Gandhi Vadra in Lucknow. New Delhi: The stage looks set for Priyanka Gandhi Vadra, the Congress general secretary for Uttar Pradesh (east) to make her first official visit to the state on Monday, starting with a roadshow in Lucknow. Congress president Rahul Gandhi and Congress general secretary for Uttar Pradesh (west) Jyotiraditya Scindia will accompany Priyanka Vadra on her roadshow, as tweeted by Rahul Gandhi today. Banners, fliers and even billboards have been put up around Lucknow city to welcome Priyanka Vadra. 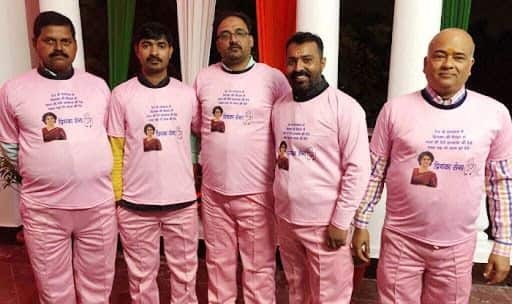 Interestingly, some Congress workers have formed a ‘Priyanka Sena’ and are wearing pink coloured suit-pant to welcome her ahead of the roadshow. Their t-shirts have a photograph of Priyanka Gandhi and a message in Hindi that for her. The Congress party office has also been adorned with tricoloured lights and drapes to usher the new party general secretary for UP east for her maiden official visit ahead of the Lok Sabha polls. Reportedly, Rahul Gandhi will return to Delhi on Monday itself, whereas Priyanka Gandhi and Jyotiraditya Scindia are expected to stay back for the next three days. They are believed to have scheduled meetings with office bearers in order to chalk out strategies for the upcoming election.